Times of the Islands – Gone Fishin’! This new South Caicos venture combines kayaking and fishing. The Turks & Caicos Islands are, admittedly, all about the water, and it is often said that you need to be either “on it, or looking at it” in order to live here year-round. Traditionally, our amazing ocean has been the mainstay of basic survival for generations of Islanders, and while some commercial fishing still takes place, the majority is now sport fishing and recreation. The type of fishing on offer varies, from bottom fishing and bonefishing through to big game fishing. However, in most cases the use of a boat is paramount and that can add a lot to the cost of an exciting day out on the water. 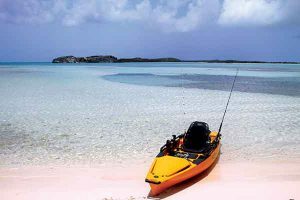 Fishing has always been a way of life in the Turks & Caicos Islands, especially on the “Big South.” Thanks to an exciting new business venture there, you can now fish from a specially outfitted kayak. 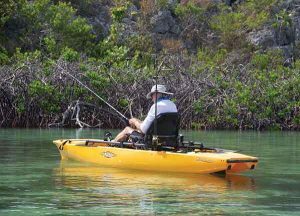 So it was of great interest when I was told about a new fishing company starting in South Caicos that offers nearly all types of fishing—not from a boat, but from individual kayaks. The claim was that it was possible to bottom-fish over coral heads for snapper or head out to “The Wall” and fish for mahi mahi and tuna! This I not only had to see, but experience myself, so plans were made and flights were booked, and just a few days later I was en-route to the island of South Caicos. After a 25-minute flight I touched down on the “Big South” and was met by Darik Riggs, along with his business partners Mike and Debbie Edwards. We set off for the East Bay Resort, which was to be my base for the next few days. I was eager to hear more about this intriguing venture. Over a cold beer, I had to ask Darik the obvious question that had been bugging me since I left Providenciales: “How in the world do I paddle a kayak and hold a rod and fish all at the same time?” With a knowing smile, Darik informs me that there are no paddles! The kayaks use a new form of technology called the MIRAGE system. Patented by Hobie and based on the natural wing motions of a swimming penguin, it is ultra-efficient and with a few simple leg strokes you can propel through the water totally hands free. I’m keen to see more, so we set off into town where we find a local contractor busy working on what will be the shop/office of Blue Waters Kayak Fishing. It’s here that as I chat with Mike and Debbie, I get my first sense of what this operation is really about—much more than just catching fish and making money. They have both visited the TCI numerous times from their home in Cocoa Beach, Florida and like so many folks before them, fell in love with the Islands and the people. This was taken to a new level when they felt they would like to contribute to the South Caicos community, helping whoever they could along the way. Fate led them to meet like-minded Darik, a ten-year TCI resident whose connections to South go way back. In fact, the old house that’s being converted into the office belongs to his wife and her family, and it’s great to see it getting a new lease on life. 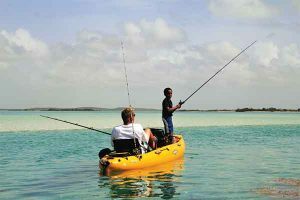 Given Darik’s passion for fishing and the Edwards’s love of South Caicos, a plan was made to form Blue Waters Kayak Fishing, with the mutual understanding that it would benefit the community wherever possible. For instance, rather than source workers from the huge Sailrock development nearby, for the crew currently working on the roof Darik chooses to use local guys who are good with their hands and keen to work hard. He knows them all, and their families, personally. The next morning, we set off for the northern tip of the island where we find the team has delivered the kayaks and is awaiting our arrival. I now see the MIRAGE Paddle system up close—it’s basically two rubber fins that drop down through a hole in the hull and are pedaled like a bike. I’m still doubtful it will get me moving. Our guide Keyton sets us up with bait, fishing rods and each kayak has a cooler stocked with cold drinks. Keyton is a charming 28 year-old South Caicos guy, and once again I see this new company using the community as its basis for future success. With a simple shove off the bank and a few pedal strokes I’m effortlessly cruising along. I’m amazed at the ease and the speed with which I can travel. Our group consists of me, Keyton and Mike, each in individual kayaks, and Darik in a two-person craft that he is sharing with his eight year-old son Auren, who seems more intent on fishing than paddling. However, Darik seems content to do the leg work and I realize this is a great trip for everyone to enjoy, from professional fishermen to families. Two-person pedal kayaks are ideal for family adventures! We head out into the calm waters and Keyton sets our hooks with bait. We can easily pedal-paddle a good speed while effortlessly casting and fishing. Darik calls to head through the channel and into the open ocean. I can see some swells and surf but am reassured that the craft are so stable you can stand up and fish from them. This turns out to be true, as the swell, surf and even wake from a passing boat have no effect on the kayak’s stability. I soon hook what I think to be a big grouper, but after a ten minute fight it breaks free. We continue to get bites all morning but the actual fish in the boat remain elusive. We head to a deserted cay, easily reached as the kayaks love shallow water, and relax on the beach for a while. On our return, Mike spots a sand bar and decides to fly-fish. Again, the kayak’s stability makes it easy to get in and out of, so this is a bonefishing dream. After lunch back at the resort, we plan our afternoon excursion. The team has relocated the kayaks to the marina and we set off for a snorkeling adventure. It’s an easy paddle out to the reef, just in front of stunning Long Cay. We tie up to the marker buoy, kit ourselves with masks and snorkels and in we go. The reef is in surprisingly good condition, considering last year’s double hurricanes that came through South Caicos so catastrophically. In no time at all we are surrounded by hundreds of reef fish and spot massive rays resting on the sea floor. We snorkel for a while with a turtle for company, then easily climb back aboard our kayaks. We head towards an area rich in soft corals and huge sea fans. I decide to film with my GoPro and ask Keyton if he can tow me behind his kayak. It’s a great way to see large areas of the ocean topography, but boats tend to be too fast and your mask often gets pushed off. The kayaks are perfect for this—it feels like you’re flying along above the seabed with no effort at all, and the person paddling does not feel any extra strain. It’s the team’s plan to mentor and train Keyton, as they see his huge potential to be a great guide and asset to the business. Once again, I think how easily an experienced fisherman/guide could have been outsourced, but this team wants to start at grassroots and grow together, a refreshing attitude that will surely benefit all involved. I reluctantly board my return flight to Providenciales and wish the team farewell. It’s been a great few days and I vow to return in the Fall when the operation will be fully up and running. I not only want to see the team in action again but I’m excited for the new fishing store in town. Oh, and I want to reintroduce myself to that elusive grouper . . .
For more information or to book a trip, call (649) 232-7475 or visit bluewaterskayakfishing.com or email darik@bluewaterskayakfishing.com.